We can find tomatoes in our diet under various forms, such as tomato purée, tomato pulp, tomato passata, sauce and paste. But are you sure to know the difference between tomato passata, sauce and paste? Anm ,d what’s inside these products beside tomatoes? And more important, what Italian law says about it? 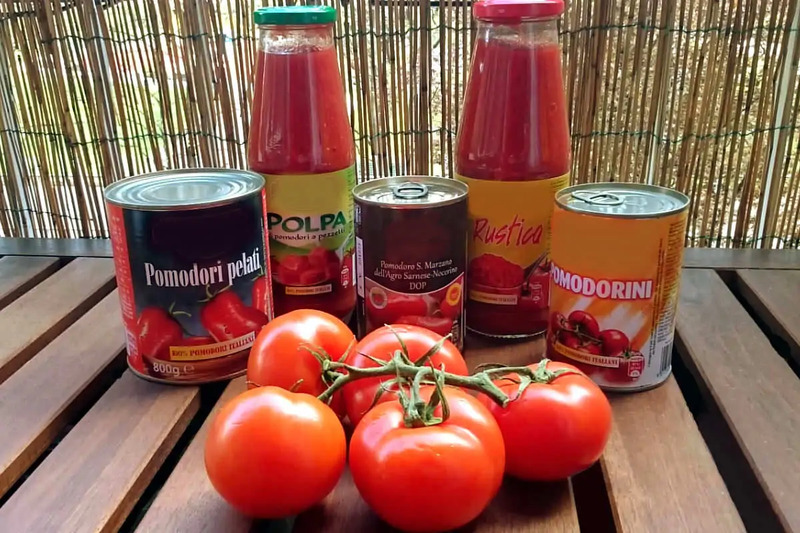 Here the difference between the five most popular tomato products: peeled tomatoes, tomato pulp, tomato passata, sauce and paste. Product description, label and suggestions. 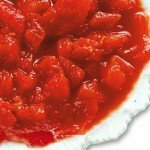 Difference between tomato pulp, tomato purée, tomato passata, sauce and paste. Tomato Passata is the translation of Italian passata di pomodoro. 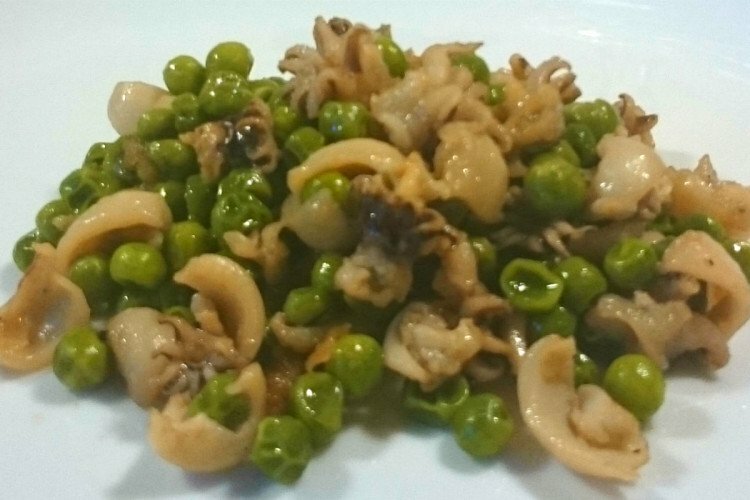 Passata is an Italian word that comes from the Italian verb passare, in English go through. This is because the tomato passata is obtained through a mechanical process whereby tomatoes go through the blades and the holes of the machine used to make passata. Sometimes tomato passata is called tomato purée and viceversa. Tomato passata is the product obtained directly from fresh, riped tomatoes. The red fruits are peeled and seeds are taken off by hand or by a tomato strainer machine or by a simple food mill. Tomatoes are chopped, crashed, smashed until you get a red and juicy sauce. Tomato passata can be rustic or silky, it depends from his consistency. For Italian law, the addition of water in tomato passata is not allowed. That’s in order to avoid the presence on the market of products that don’t come from fresh tomato, but from tomato paste. It may be added salt, acidity regulator (usually citric acid), spices and other aromatic plants. Among the tomato products, tomato passata is the only one with the obligation to report the origin of the tomato on the label. Usually you can find tomato passata on the market in glass bottles 0r jars. Check the label: if you find other ingredients such as onion, oil and celery, then, by italian law, they can not be named “tomato passata”. They are in fact tomato sauces. 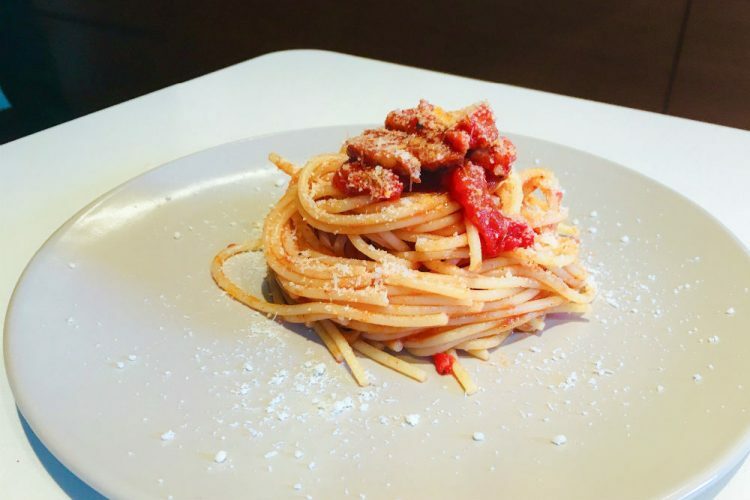 You can use tomato passata to make pizza, or just add it in many pasta sauces, such as sugo all’amatriciana, penne alla vodka, lasagna, spaghetti with tomato sauce or fresh egg noodles with bolognese sauce (Ragù alla Bolognese). There are many Italian recipes that require the use of the tomato passata recipe. COSI’ COM’E’– It’s an Italian company with a range of top quality products harvested by hands and packed in glass jars and bottle, made from the best variety of small tomatoes: Yellow Datterino, Red Datterino and Pizzutello. They use only small tomatoes harvested in their land, Piana del Sele. Cultivation follows the rules of the integrated pest control, focusing on quality, in the total respect of nature. They don’t use genetically modified organism. Plants grow in a natural way and tomatoes are harvested by hand only when fruits are perfectly ripe. MUTTI – It’s a company well known in Italy because of its tomato passata, paste and pulp. These products comes from selected tomatoes that are shredded at room temperature (20 °). It’s fast and easy to use Mutti tomato passata because all you need to do is heat it up. It remain a brilliant red, has a velvety consistency and has a sweet flavor. 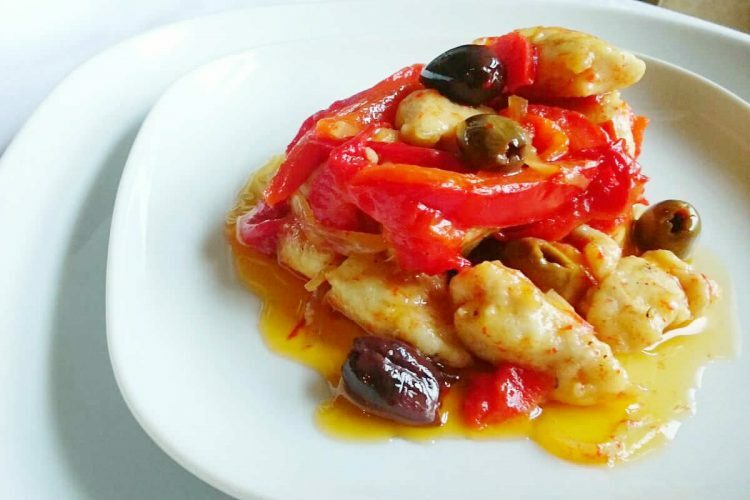 It’s perfect to make any quick dishes, like eggs, white meats, sauces for stuffed pasta and thin crust pizzas. CIRIO – Cirio tomato passata, thanks to the high quality of its tomatoes, has a very rich flavor. 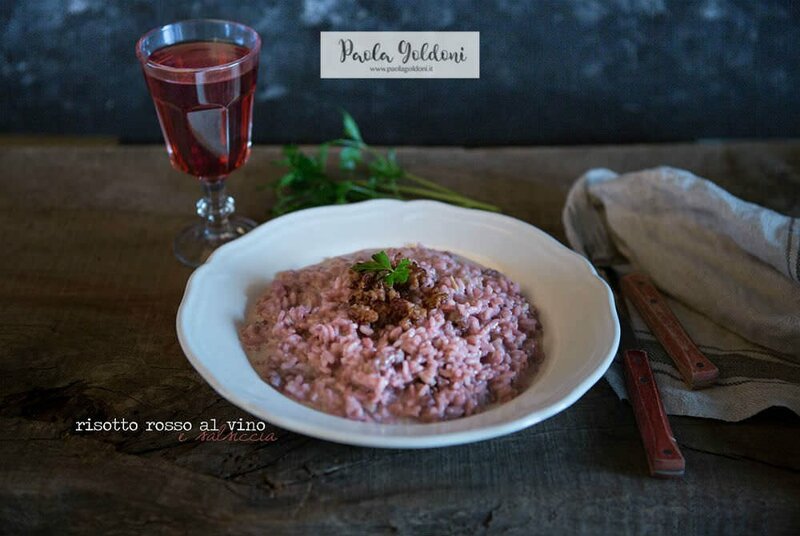 There are two variants: Passata Rustica (with an unmistakable consistency, it’s made with an exclusive wide-textured sieve. It keeps the characteristic taste of fresh tomatoes, perfect for pasta sauce) and Passata Verace (creamy, suited for every recipe. It has a velvety consistency and a naturally sweet flavor). The list of ingredients you can find in a tomato sauce is more or less long, depending on the type of sauce. Tomato sauce can contain tomato passata or pulp and paste, in addition to oil and salt. Sometimes you can find celery and onion as well. In fact it’s enough to put the sauce into a saucepan, reheat and season. Among these, there are tomato sauces with meat or vegetables. 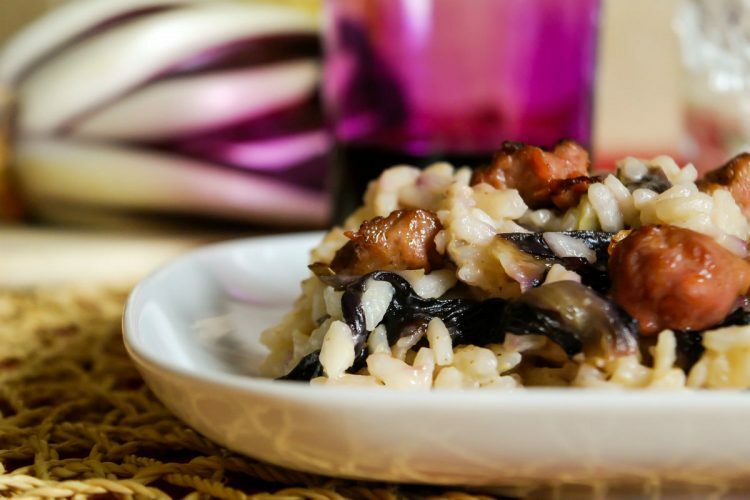 BARILLA – Barilla sauces are made according to Italian tradition, combining simple ingredients in tasty recipes. The company uses only Italian sun-ripened tomatoes, selected meat from controlled supply chain and the best vegetables, without adding dyes or preservatives. 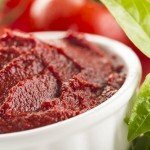 Tomato paste is a product based on tomato extract. Tomatoes, through industrial processing plants and after careful cleaning to be deprived of excess water, are crushed and preheated to high temperatures ranging from 85 ° to 100 ° C (185F to 212F). Inside the evaporator, tomatoes go through different stages: its concentration level is gradually increased to reach the required density. The result is tomato paste or double tomato paste. In the first case, by Italian law, the degree of concentration must be in a range that varies between 18% and 28%, while for the double one the consistency must reach a level between 28% and 30%. So that you have an idea: 5-6 kg of tomatoes are necessary for 1 kg of tomato paste. Tomato paste is the perfect ingredient to add extra color and flavor to recipes that require long cooking times such as meat sauce, soups and stews. Peeled tomatoes are made with fresh, healthy, riped tomatoes. They are whole tomatoes; once blanched then it’s necessary to peel them. Easy to make by yourself, you can find them on the market in glass jars or aluminum cans. In most cases Italian law allowes the addition of a little of tomato juice, water and of an acidity regulator (citric acid) and it gives the possibility to add salt. 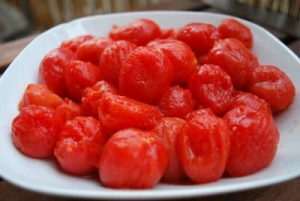 Alongside traditional peeled tomatoes, made with long tomatoes, plum type (San Marzano), there is a variant made with cherry tomatoes. They are not peeled, as explained on the label. On the packaging it is not necessary to write the origin of the tomatoes. The preparation of tomato pulp is the same as peeled tomatoes, but unlike them, tomatoes are chopped and the seeds are taken off. Also in this case, it’s not necessary to write the origin of the tomatoes on the label. No Replies to "Tomato Passata, Sauce and Paste. Do you really know the difference?"